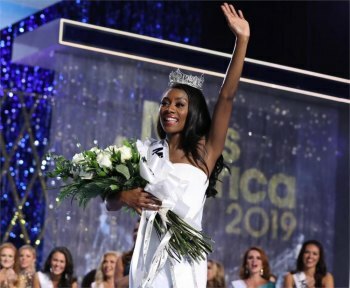 ATLANTIC CITY, NJ (September 9, 2018) – Miss New York, Nia Franklin, was crowned Miss America 2019 tonight at the birthplace of the iconic competition in Atlantic City’s Jim Whelan Boardwalk Hall. The Miss America competition was broadcast live on ABC. Through her social impact initiative, Nia will bring her passion for music and performance to advocate for the inclusion of arts as an important part of education. For the talent portion of the competition, Nia chose a classical vocal performance. First runner up in the competition was Miss Connecticut, Bridget Oei, who earned a $25,000 scholarship. The winners of the $5,000 STEM (Science, Technology, Engineering and Mathematics) scholarships were Miss Massachusetts, Gabriela Taveras; Miss Montana, Laura Haller and Miss Nevada, Alexis Hilts. Miss Hawaii, Penelope Ng Pack and Miss South Dakota, Carrie Wintle each received $5,000 as recipients of the Women in Business scholarship. The 98th Miss America Competition was hosted by Carrie Ann Inaba of ABC’s Dancing with the Stars and TV personality Ross Matthews. The 51 candidates representing all 50 states and the District of Columbia competed in preliminary competitions earlier in the week.